Searching the Pinterest for an interesting free crochet chart to be translated into a written pattern I came across this lovely flower, which due to the color combination I chose - it's called 'The Peacock Flower". With color A, chain 5 (not 6 as the chart shows) and join to make a ring. Round 1: ch6 and in the first st make 2 dtr, ch6 and sl st in the same st. Repeat this pattern for the whole round. Round 2: Insert color B in between two petals and ch 5. In the chain below, make 1 hdc, on the 1st dtr make 1 dc and tr chain 2, make 1tr and 1 dc on the dtr st below, hdc1 in the chain, ch 5 and sl st between the petals. Repeat this pattern for the other 4 petals. Round 3: sc5 in the chain below, in the next st make 2dc, next make 1 dc and 1 tr, on the chain below make 2 dtr, ch2, make another 2dtr in the same chain (below), make 1dtr and 1dc in the next st, then 2dc in the next. 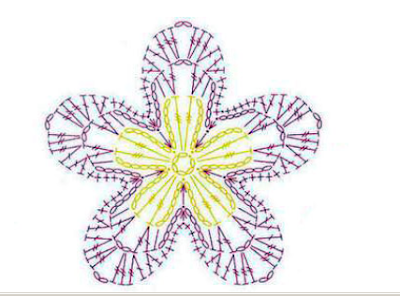 To finish the petal pattern, sc 5 in the chain, sl st and repeat pattern for the other 4 petals. 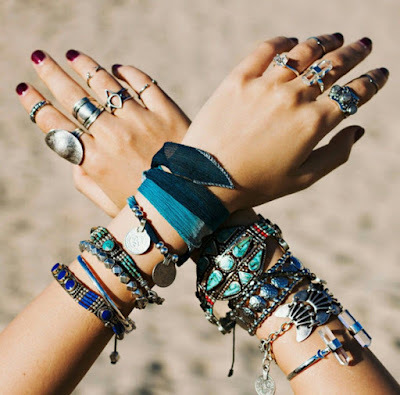 Continuing our Bohemian Series here on the blog, today I have prepared a collection of amazing bohemian necklaces, bracelets and rings. 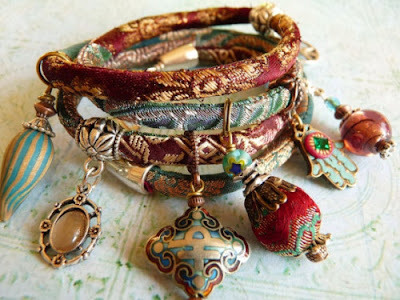 Bohemian jewelry designs tend to be an eclectic mix of different materials, colors and textures like beads, glass, cotton, leather, metal and ceramic, depicting the adventurous, carefree essence and building a unique style. The jewelries vary from elaborate, heavily decorated designs to simple and delicate looking ones. We rejuvenated our personal collection with some new pieces for our upcoming holiday so the pictures will come a bit later. Until then, enjoy this collection. 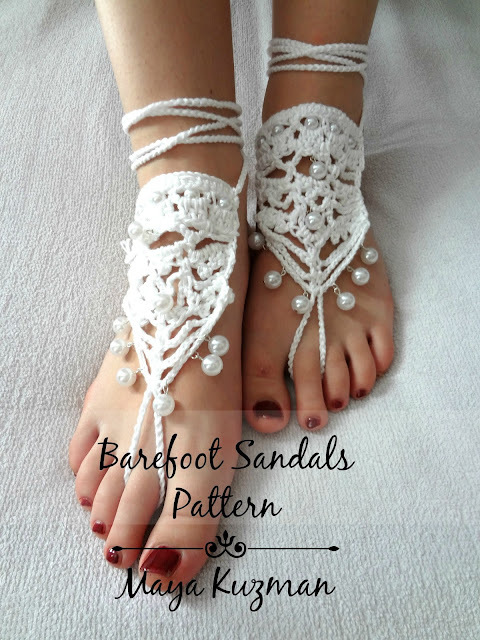 Continuing the series of the Bohemian Summer here on the blog, I am happy to announce there is a new, gorgeous barefoot sandals pattern in the shop. The sandals are lacy and decorated with pearls which accentuate the elegance and intricacy of the lace pattern. Some of my former anklets and barefoot sandals here, here, here and here. We are both pleased how it turned out. Now, in retrospect, as I am going to make another one, I want to add a more elaborate edge below the bust and perhaps make the straps at the mid back a bit narrower. Our next plan includes making a crochet bikini for the summer, without a pattern too, so I hope it turns out as good as this one. We have had quite a heated start already and this promises to be one hot summer. 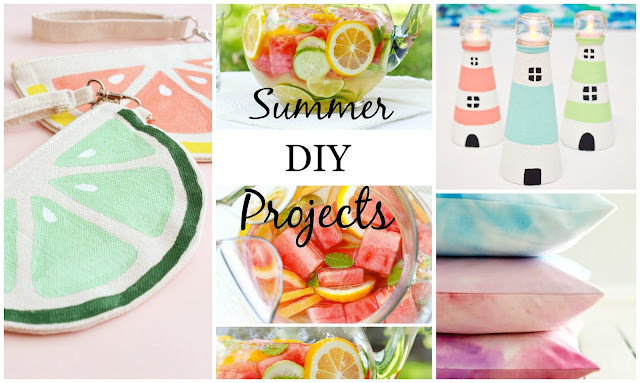 To mark the summer, I compiled 10 fantastic summer projects you can do yourself or with kids to bring freshness and coolness to your home. Enjoy the selection and hope you make some of these! We have a pair of Bohemian Barefoot Sandals in the shop. The front panel does the magic. 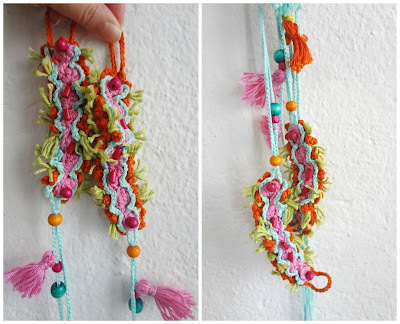 It is crocheted in a unique pattern with a wonderful mix of colors which along with the wooden beads and tassels make these sandals a desirable and eye-catching feet jewelry for the summer. There are more different styles of these sandals coming soon, so I'll keep you posted. Today, in line with our Bohemian Summer I want you to meet a compatriot of mine - an extraordinary and dazzling bohemian clothes designer. I was bedazzled and enchanted by her gorgeous creations when I was first introduced to her clothing line - a feeling that has grown in intensity over the years and I hope I can transfer the same feeling to you through this interview so you can experience the Nalini magic yourself. Who is Elena privately and professionally? Elena is a 34 year old woman, happily married with two children - Danaya (6) and Nathanail (2), who is constantly searching for the perfect balance between the role of a mother, wife, journalist (my day job) and designing. I constantly dream about the markets in India, Mexico and Marocco - their colors, fabric and scents. I don't have a formal fashion education, but the good taste, art and handwork have always been present with the past generations of my family. We all carry with us the energy of our ancestors, and I do too. How did the Nalini story begin? A few years before I opened my online shop, the desire to make clothes started sparkling. 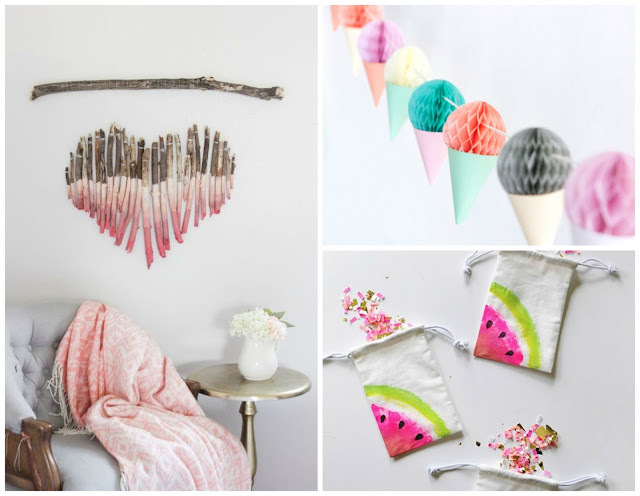 I love everything handmade: knitting, sewing, embroidery, hand-dying fabric. In 2012 I finally plucked up the courage and made my first photo - shoot with my friends Andrijana & Dimitar and I opened up to the world. My clothes started selling and I went on one of the most inspiring trips to the most magical country - Marocco. For a whole month my husband and I wandered throughout the country and that was the realization of my long time dream. I can still sense and feel the energy of this country, its bewitching scents, colors and landscapes which are reflected through my design process. Your creations depict freedom, bohemianism, timelessness. What fashion era do you feel close and where do you draw inspiration from for your designs? Designing is a spiritual food for me. The search for fabric, laces, ribbons, buttons and bells is an enormous adventure for me - equivalent to looking for hidden treasure. I love Moroccan carpets, hand-woven fabric, white embroidery on Edwardian era dresses, Indian hand-block printed cotton, old silk Indian saris. 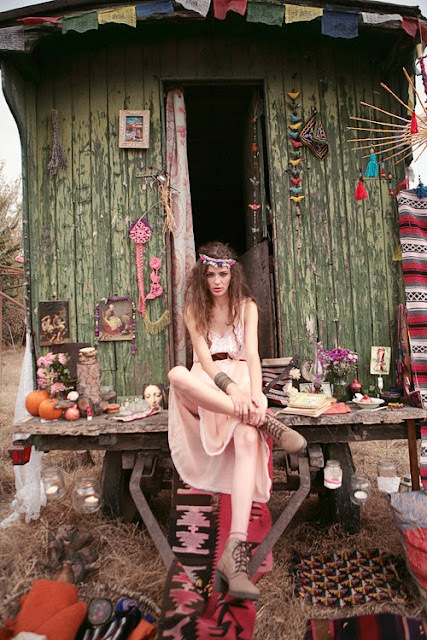 My collections are deeply rooted in travels and I have this deep admiration for the nomadic aesthetic. 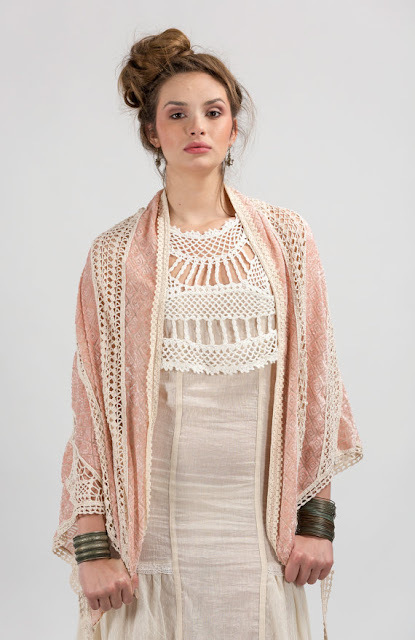 I love handmade things and I incorporate a lot of hand knitting, block printing, weaving and embroidery into my designs. These clothes may not be easy to produce, but they feel richer for it. For me they are valued possessions, a true heirloom pieces. I like things to feel easy, natural and comfortable. 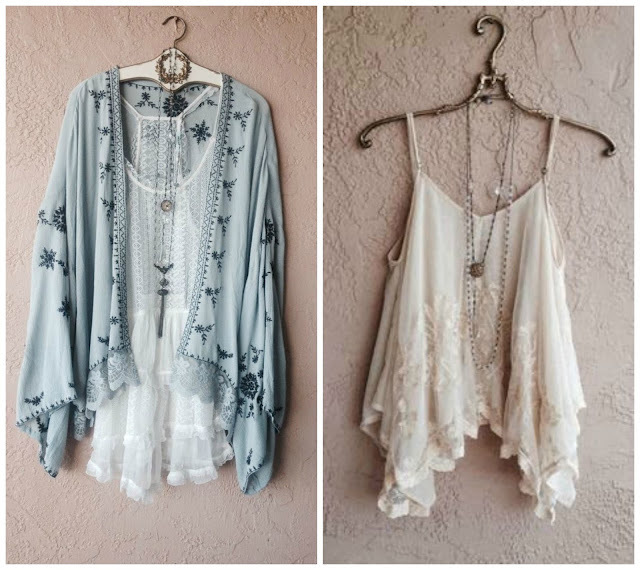 I love patterns and soft colors and white. I love softness and movement. I am addicted to beautiful textiles and vintage. 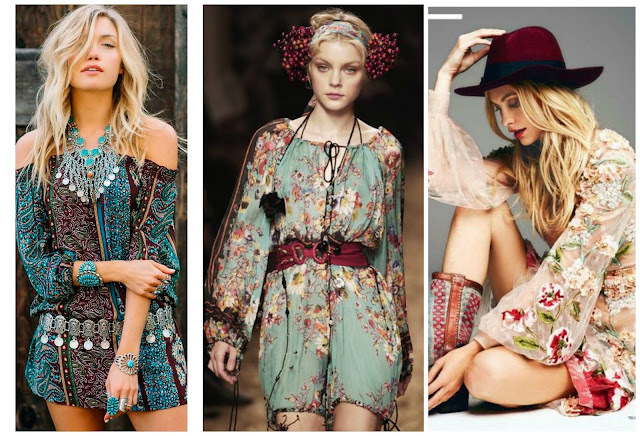 I'm always inspired by the romantic designs from the 70s, soft feminine fabrics and loose bohemian garments. According to you, who is the Nalini girl? The Nalini girl is creative, free-minded and open-spirited, boldly experimenting with fabrics and materials and she is not afraid to combine several layers of clothing. She does not follow current fashion trends; she wears soft and natural clothing, delicate dresses with a touch of romanticism. She is not overburdened with dressing up and does not think a lot about it. What fabrics do you use most often in your work and what else do you use while designing? Out of fabrics, the cotton gauze is extremely inspiring for me. It is natural and so soft when put on skin. It is noble and lets you play with it the way you want. Sometimes I put it in the spotlight, sometimes I use it in the background - as a backdrop. If I want to enrich it, I just add a cotton knit or hand printed Indian cotton. I especially care about how things are made. For me, the positive energy, enjoyment and pure love while making them is very important. I believe that a piece holds the energy of its makers and it spreads. In today's world of mass consumerism and cheap items without soul, it's highly important to support this 'maker's movement'. Something that is made with love and care is very special; it has a bit of soul. 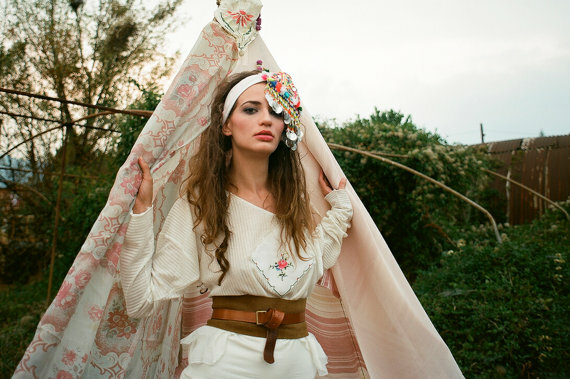 Between the most wanted pieces in your Etsy shop are the Bohemian bridal dresses? Are people interested in them and what is the feedback you receive from them? 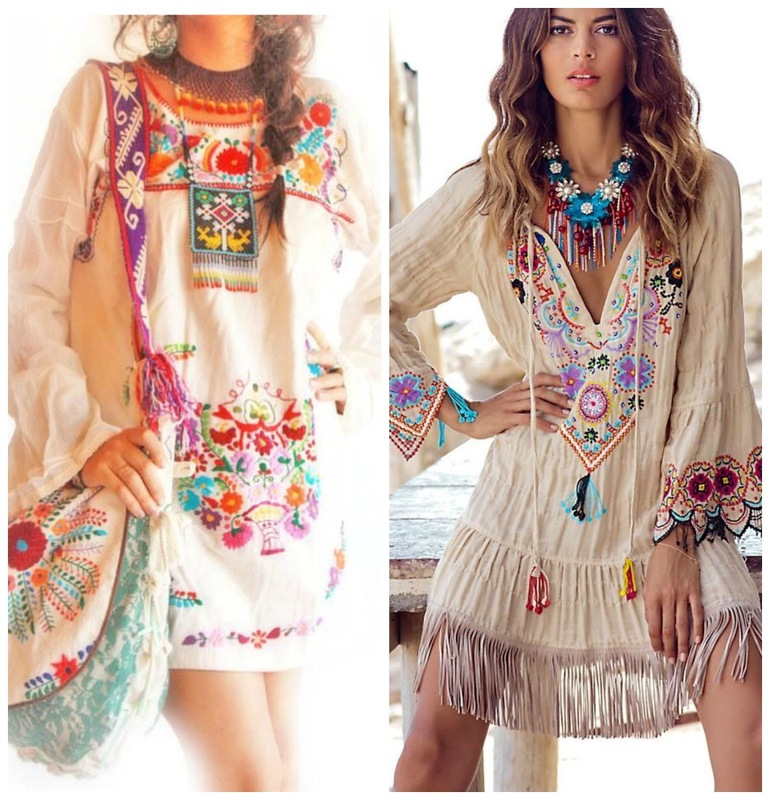 These dresses are the most wanted in my shop, especially the Bohemian gauzy maxi dress with vintage laces all over and mesh sleeves. This dress is also the most complicated design in my shop. It's made of 40 different pieces and it takes many long hours to be made. But in the end, you get a versatile dress with a wonderful fit that slims the figure. As far as feedback is concerned - it just warms my soul every time I read how people are happy to discover my shop, how much they like the softness of the fabric, the details; the perfect fit of the dress since that is one of the pieces they are going to cherish for a lifetime; the appreciation that their dress is made with utmost care and love - that is the biggest compliment for me! Plans for the future? Where do you see your brand on the fashion scene in the future? I have been dreaming for a workshop of mine for a couple of years now and for more free time to make the designs swirling in my head come to life. This past winter I went on a hand weaving course and I have been deeply in love in this magical and painstakingly beautiful process. I'm deeply amazed by the talent of the weavers with whom I've worked on designing on my first hand loom textile. These people are one of the last weavers in my country that still keep alive this traditional craft, which is an important part of our heritage. I feel a deep admiration for their hours and hours of long work on old wooden handlooms. Thank you Elena for making our Bohemian Summer richer and we wish you tons of success in the future! Hello to you and to a fresh new week! 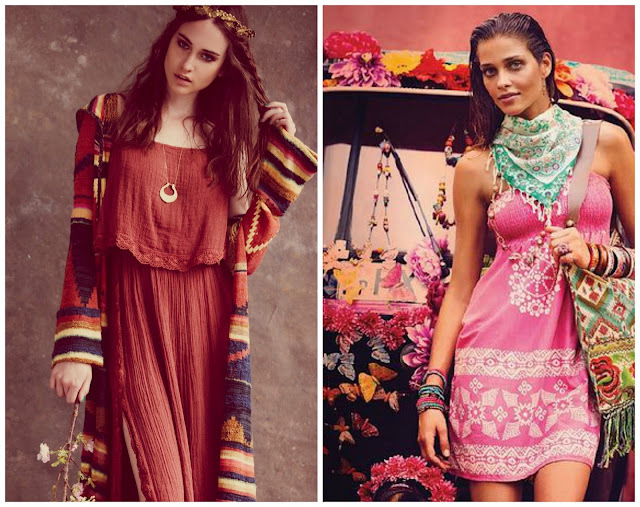 We are starting the bohemian summer series with an introduction of bohemian clothes. 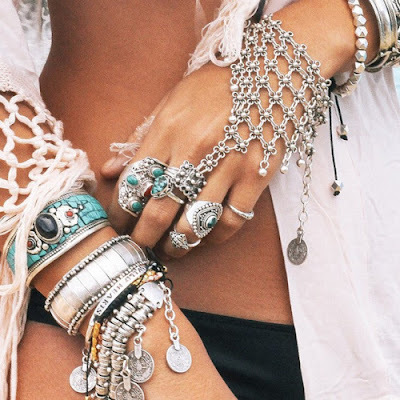 The trend slowly and gradually started the past summers with body jewelry and certain clothes like maxi skirts and dresses and we mustn't forget - the kimonos. They were an absolute hit last summer. 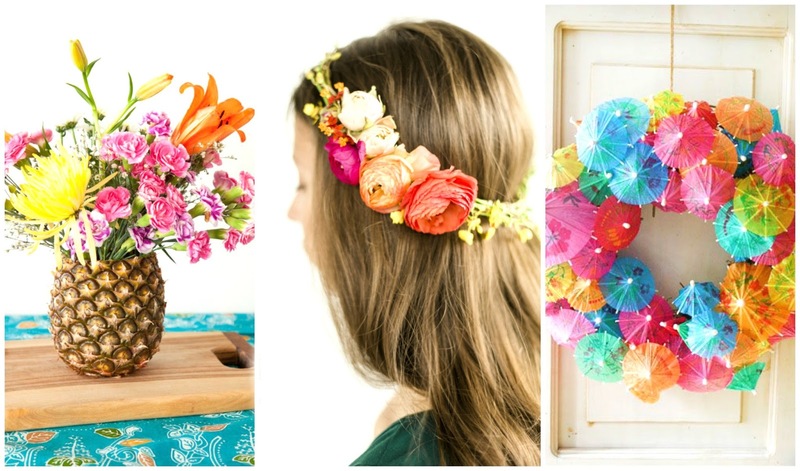 The trend continues to evolve and grow and I am sure it will have its peak this summer. 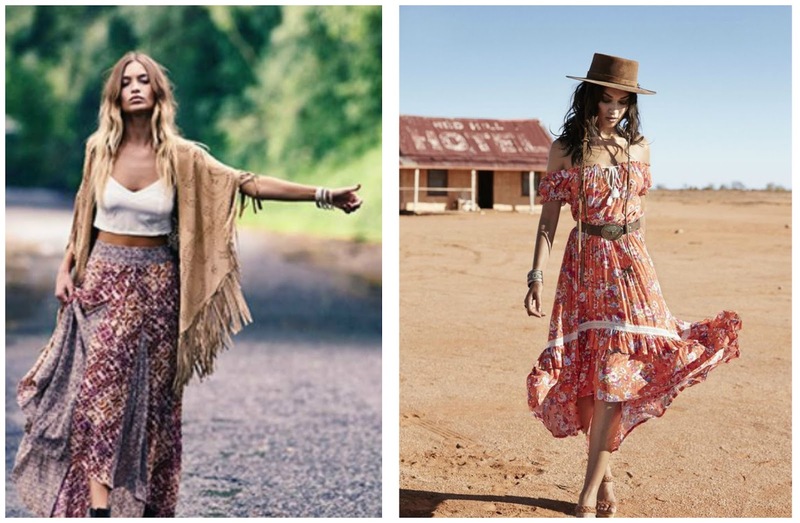 Bohemian clothes are lightweight and loose-fit, flowing and layered, with lots of crochet and lace (inserts), mostly transparent and most often colorful. 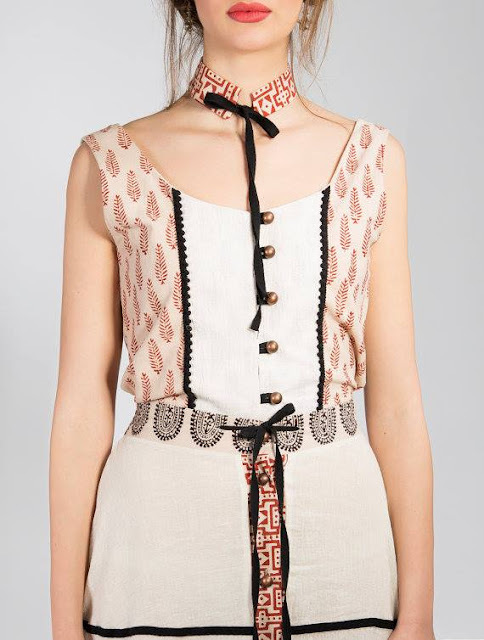 The clothes are matched in a non-traditional manner by mixing prints and using unusual color combinations. They include lots of oriental elements including robes, kimonos and ethnic designs of Persia, India, Turkey and China. This style is bold, relaxed and laid-back, playful and just perfect for expressing one's individualism. What piece would you wear over and over again? 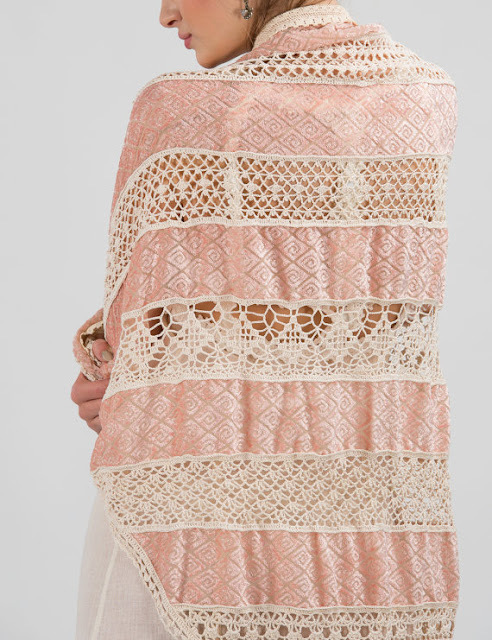 I am into lace shirts and tops and maxi dresses / skirts right now. And I hope I can find a flowery kimono I could wear to the beach this summer. 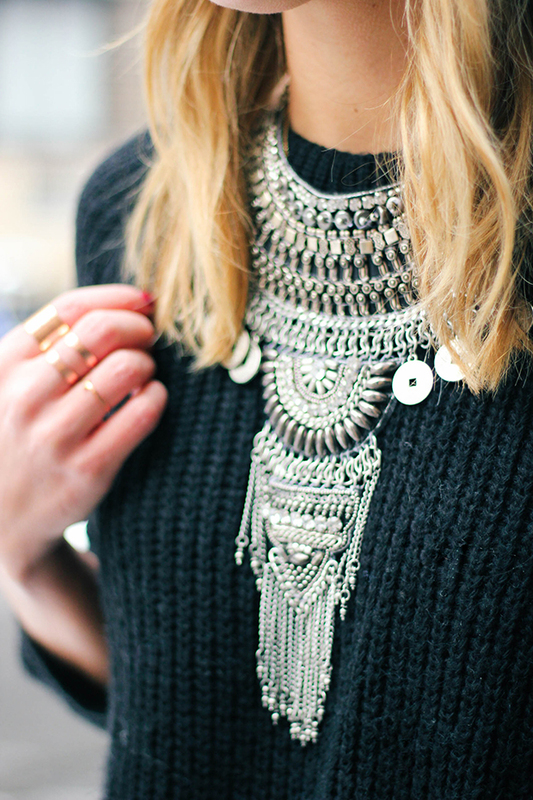 The jewelry plays a very important part so we'll get on that topic in another post.